Baseball fans woke to tragedy and shock this morning with the news that José Fernández and two others had been killed overnight in a boating accident. 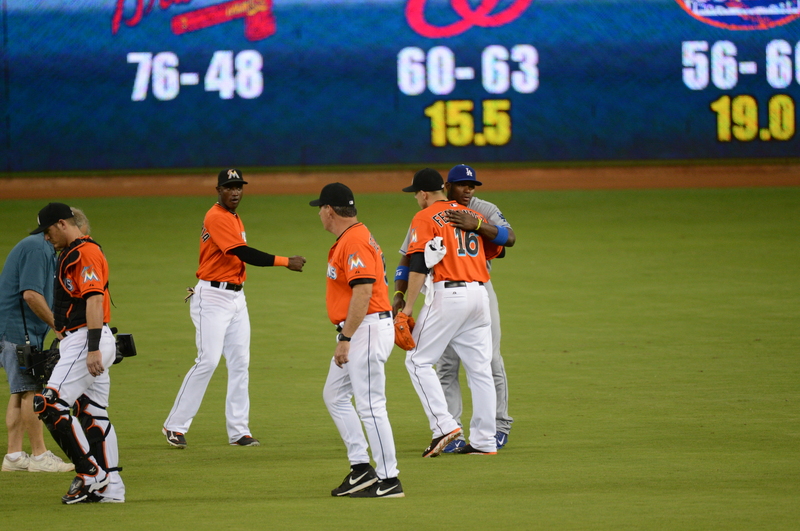 “José Fernández was one of the nicest, most respectful, young players I ever had the pleasure of getting to know. 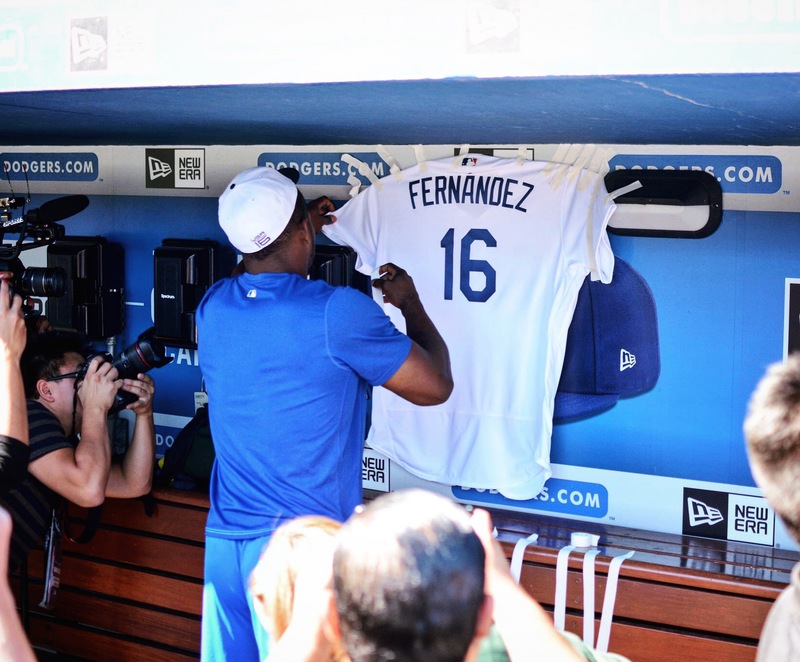 My heart is shattered,” SportsNet LA’s Alanna Rizzo said on Twitter this morning, expressing the sentiments of so many. “The fact that José, his mom and others risked their lives to flee Cuba, saved her from drowning, only to die in this way, is incomprehensible,” she added. For Dodger fans of my age, it was instinctive upon hearing the news to think instantly of former Dodger pitchers Tim Crews and Bobby Ojeda, who were in a 1993 Spring Training boating accident that took the life of Crews and their new Cleveland Indians teammate, Steve Olin. Gary Smith of Sports Illustrated wrote a devastating story four months after that accident, and Jon Saraceno and Bob Nightengale of USA Today revisited in 2013. Absolutely sick to my stomach right now. RIP Jose. Thinking and praying for you and your loved ones! Andrew Toles found the golden ticket. Impossible to believe even as it was happening right in front of us. Joe Davis making the call into his mic, TV capturing the dramatic picture. Do you believe in Mira-Toles?! YES! 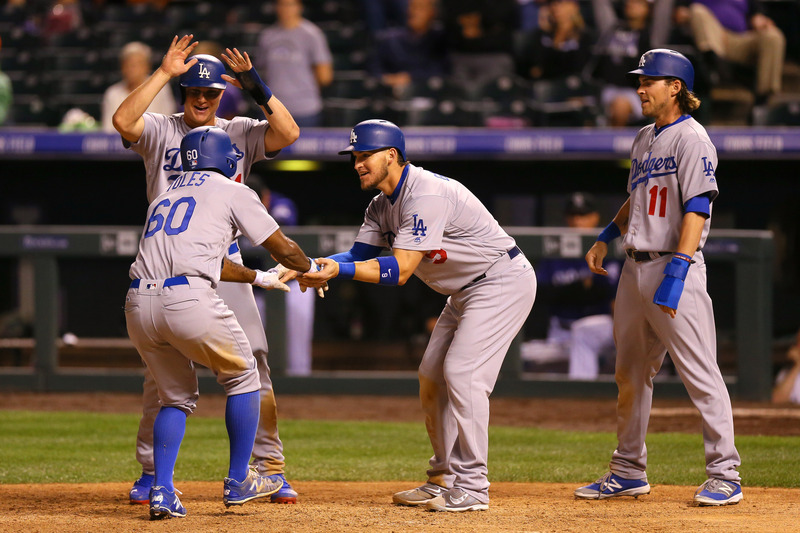 The Dodgers, who scored three runs in their first 25 innings at Coors Field this week and trailed 8-2 after seven innings in their series finale with the Rockies, rode the Wonkavator to three runs in the eighth and five in the ninth — capped by Andrew Toles’ everlasting gobstopper of a grand slam — to a 10-8 victory over Colorado. In a week-long performance that resembled a Broadway show purposefully designed to be the worst it could possibly be, the Dodgers shocked expectations (spookily similar to Alex Guerrero’s ninth-inning grand slam last season) by bringing their fans to their feet. This Dodger team, a veritable young Frankenstein for all the ways it has been reconstituted during this injury-plagued, transaction-filled season, delivered a “Puttin’ on the Ritz” finish thanks to Toles, whose remarkable rise from Single-A ball now has him batting .397 with a .463 on-base percentage while slugging .690 on the big stage. Let’s not go stir-crazy: Toles isn’t about to unseat Corey Seager for the National League Rookie of the Year Award. But for all the publicity that Yankees freshman Gary Sanchez is getting in New York, Toles leads Sanchez and all other late arrivals (minimum 50 plate appearances, in other words) in on-base percentage, holds similarly gold-medal status in batting average and is riding a silver streak to second in slugging percentage. 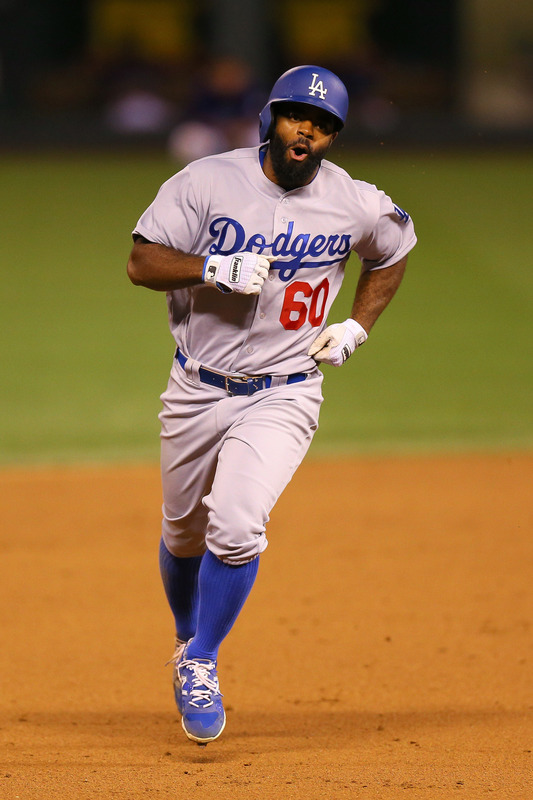 Andrew Toles is, as my wife likes to say, "insanity sauce." For the Dodgers, it was thievery worthy of Bonnie and Clyde. Major League teams had lost 448 out of 449 games this year when trailing by at least six runs after the seventh inning. According to Elias Sports, this franchise rallied from a similar deficit against the Cleveland Spiders in 1899 — this is only the fourth time they’ve done so in 117 years since. Did the Dodgers need any help? Oh, all they could get. 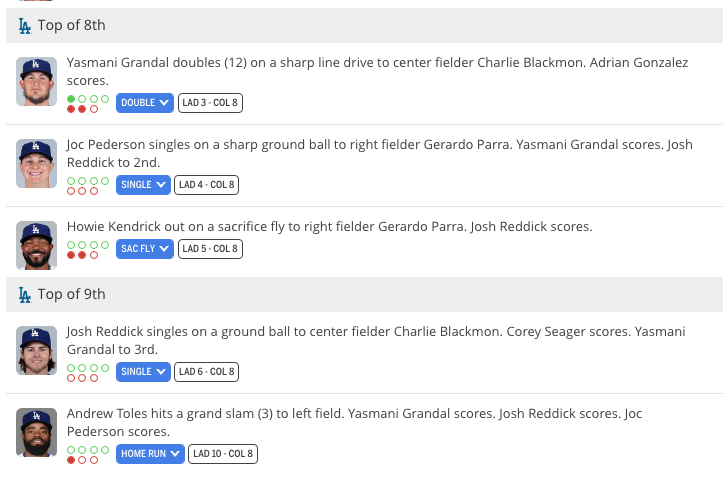 And they got it, with a string of hits and walks leading up to the opposite-field blast by the Way-to-Go Kid. Lee Pfund, who pitched 15 games for the Dodgers in 1945 and later went to become an immensely successful baseball and basketball coach at Wheaton College, passed away Thursday at age 96. Pfund, the father of former Lakers coach Randy Pfund, coached Wheaton to the 1957 NCAA College Division basketball title and won 362 games from 1952-75, then later was honored by the school naming its baseball stadium after him. Born in Oak Park, Illinois nine days after the 1919 World Series involving the Chicago White Sox ended, Pfund pitched two shutout innings on April 25, 1945, in his Major League debut, a memory he described in this Dodger Insider story commemorating the 70th anniversary of that moment and recalling his life in sports. Click here to read the entire story. Our best wishes go to Randy Pfund and the Pfund family. At 5:05 a.m., 20 years ago today, former Dodger All-Star infielder Mike Sharperson died at the age of 34, following a one-car accident near the junction of Interstate 15 and 215 in Nevada. All-Star infielder. 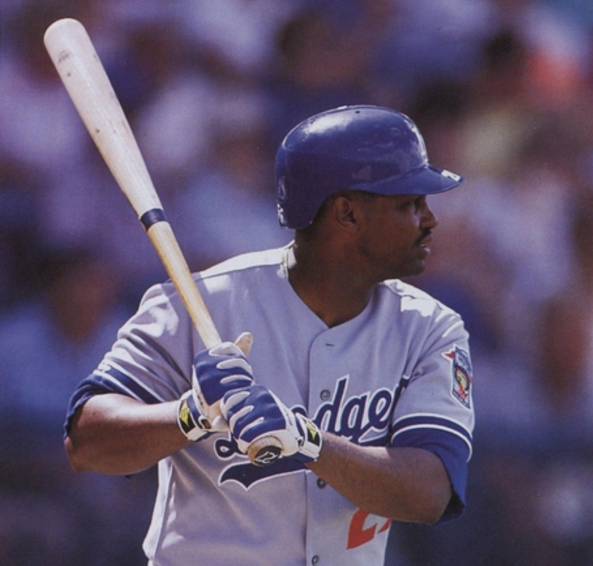 When Sharperson made the National League All-Star team in 1992, he and the Dodgers got a lot of grief. It was a year of grief. Los Angeles was in turmoil after the riots of late April. 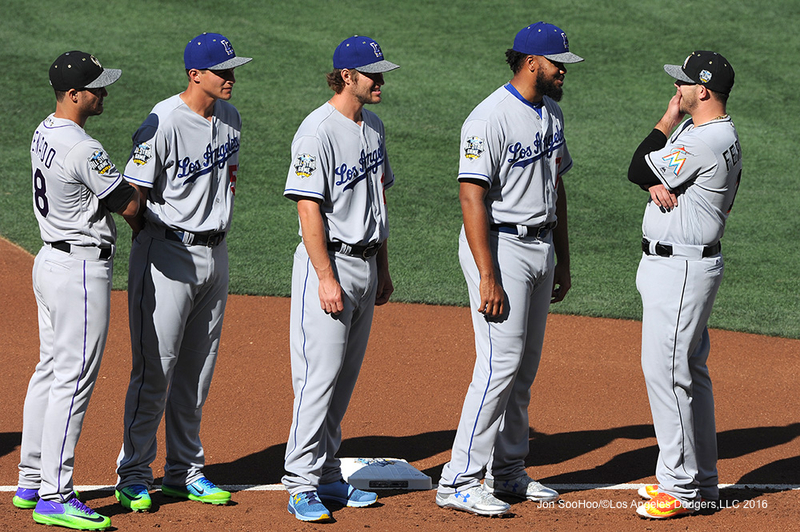 The Dodgers were on their way to their worst season in 87 years. Their best hitter was a 30-year-old who had never played a full season in the Major Leagues, whose career high in home runs was three. The right-handed Sharperson was best known as a platoon partner of lefty-hitting Lenny Harris. A good contact hitter who batted twice for the Dodgers in the 1988 playoffs, Sharperson hit .297 with a .376 on-base percentage and more walks than strikeouts in 415 plate appearances in 1990. He played and hit a bit less in 1991, when the Dodgers lost the National League West title by one game. Then in the spring and early summer of 1992, as Darryl Strawberry faded and before Mike Piazza arrived, Sharperson — still alternating at second and third base with Harris, Juan Samuel, Dave Hansen and Dave Anderson — somehow emerged as the Dodgers’ best hitter. 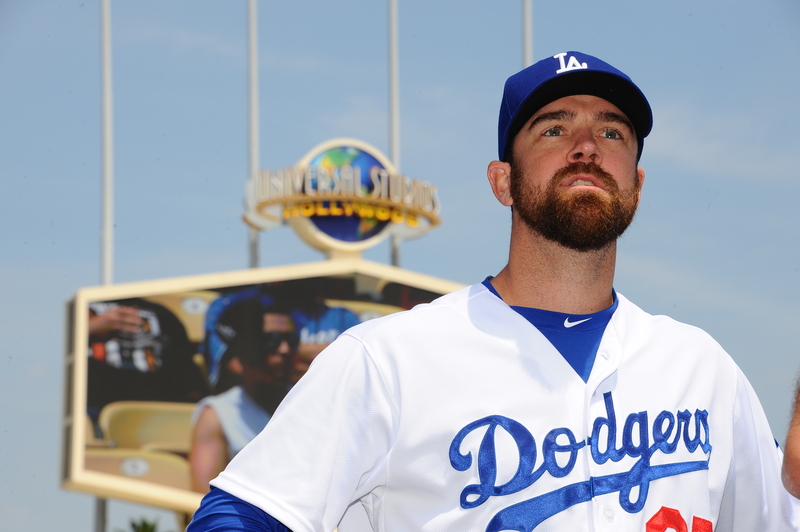 Come July, the Dodgers needed an All-Star representative, and Sharperson was it. Today, we remember Alan Young, the “Mr. Ed” actor who passed away Thursday at age 96. 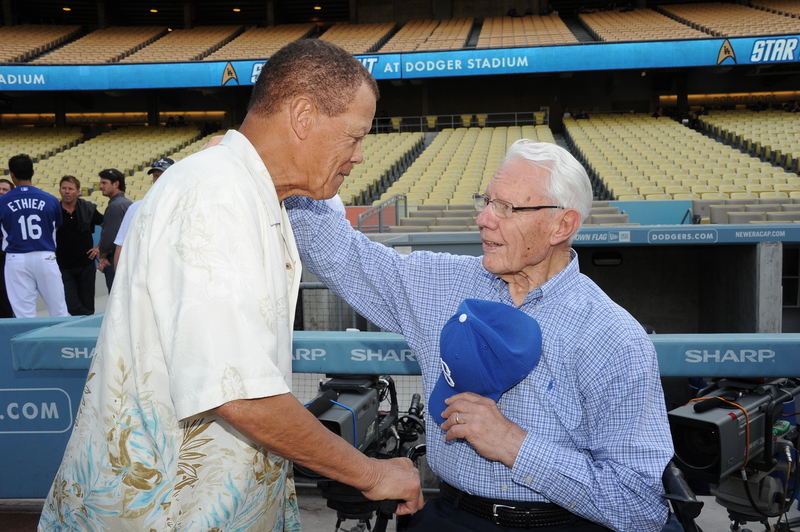 Young and his horse companion made a memorable visit to Dodger Stadium for the 1963 season premiere, highlighted above. Sandy Koufax, Willie Davis, Leo Durocher, Johnny Roseboro and more appear. As you know, Louis Coleman’s grandfather, Harold Louis Coleman Sr., passed away last week. 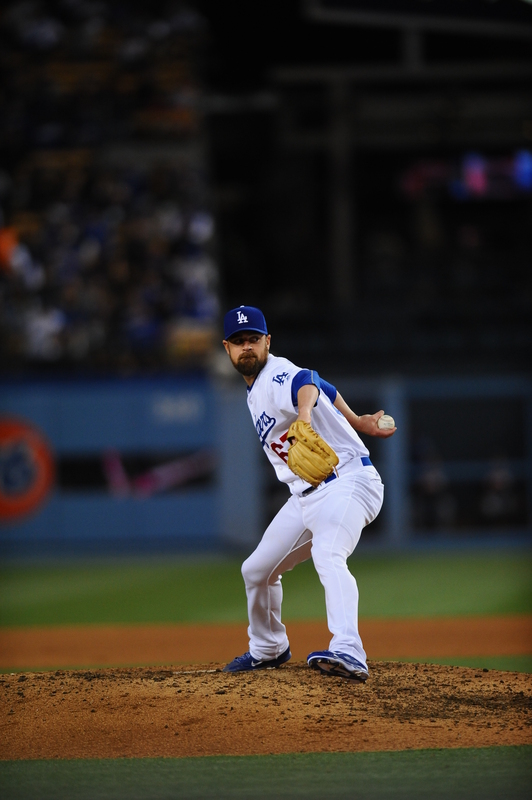 That’s about all we knew about the Dodger reliever’s need to go on bereavement leave. 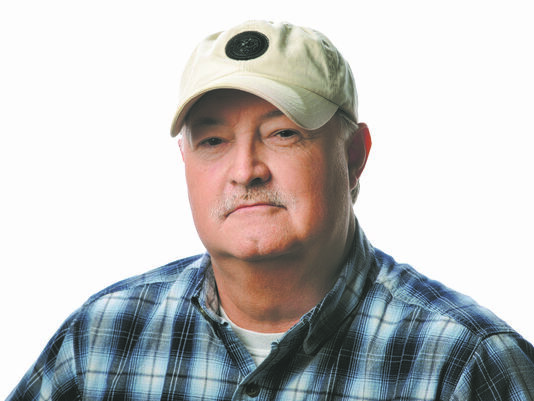 But thanks to a column by Coleman’s uncle, Billy Watkins, in Jackson, Mississippi’s Clairon-Ledger, we now know much more. Watkins’ piece is not only a reflection on his own uncle, but a reflection on our priorities, our choices and our lives. … I asked Uncle Harold a few years ago something about my maternal grandfather, who I loved deeply. Uncle Harold was one of the few still alive who knew the answer and the only one I felt comfortable asking about it. Understand, it wasn’t concerning anything illegal or shameful. It was merely something I wanted to know about my grandfather. It was his way of inviting me to come see him. I never made that trip. So whatever he would have said to me was lowered with him into the black Delta earth late Saturday afternoon. … Hal and Kathy’s son, Louis, spoke at the funeral. As a member of the Kansas City Royals in 2011, Louis earned his first save at Yankee Stadium in New York and his first win at Fenway Park in Boston. You can read the entire piece here. Thanks to Watkins’ longtime friend, Dodger senior vice president of planning and development Janet Marie Smith, for forwarding it to me. A.J. Ellis meets former Brooklyn Dodger Mike Sandlock at New York’s Citi Field on July 21, 2012. 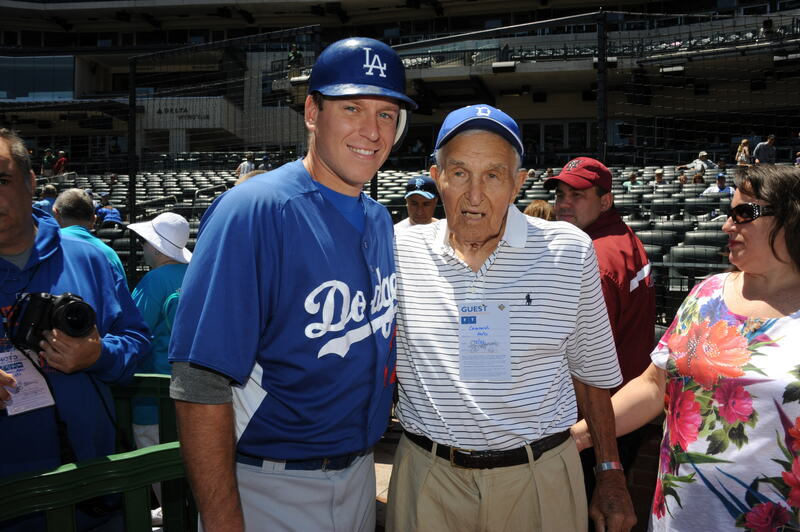 Former Brooklyn Dodger catcher and infielder Mike Sandlock, who at age 100 was the oldest living former Major Leaguer, passed away on Monday night in Cos Cob, Connecticut. Joe Garagiola, the one-time big-league catcher and longtime big-league announcer who was Vin Scully’s partner on NBC the night Kirk Gibson hit his 1988 World Series home run, passed away today at age 90. Garagiola played in the Majors from 1946-54 and worked as a broadcaster until he was 87. He was also a frequent presence on entertainment shows, such as “To Tell the Truth” and “The Tonight Show with Johnny Carson,” but if you’re from my generation, you remember him fundamentally for his work on NBC Game of the Week baseball broadcasts. His voice was integral to Saturday afternoons for years. Today, Scully shared some thoughts about his former colleague. 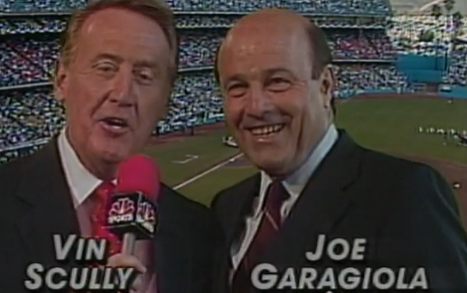 “I was very fortunate to know and work with Joe Garagiola,” Scully said. “Boy, did he surprise me as a broadcaster. Joe was always a funny and decent man, but he was a big surprise to me. When we got together in the booth, he was very serious. The part that surprised me was how well prepared he was for each and every telecast. Joe didn’t just rely on his experience as a player, but he did his homework and all of us benefited from his knowledge and research.